The aurora is one of the most magnificent natural phenomena on Earth. Many early polar explorers described its beauty, or attempted to. “I have no words in which to convey any adequate idea of the beauty and splendor of the scene,” wrote one participant in the First Polar Year, the international exploration campaign of 1882–1883. “It was a continuous change from arch to streamers, from streamers to patches and ribbons, and back again to arches” [Greely, 1894, p. 139]. Fig. 1. (left) The development of the auroral substorm during the expansion and recovery phases is shown schematically. From Akasofu . 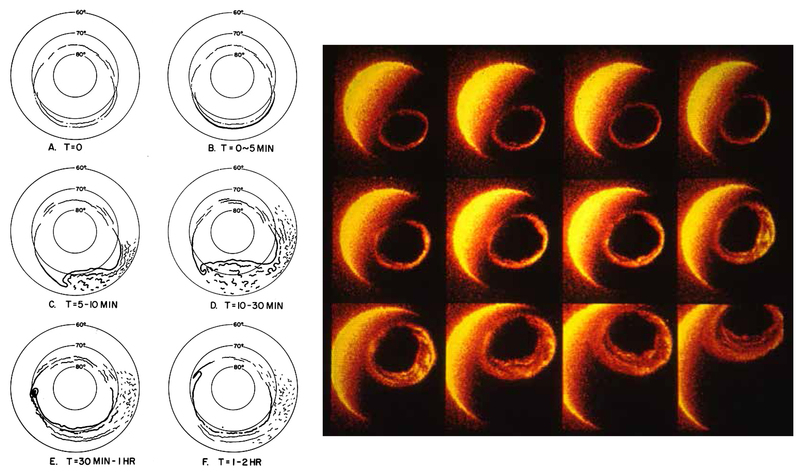 (right) The first series of global images of an auroral substorm observed by the Dynamics Explorer satellite. From Frank et al. .
Viewed from space during intense geomagnetic storms as Earth suffers an onslaught of particles from solar eruptions, this wonder is an explosive, widespread event, during which violent movements spread rapidly from the midnight sector along a belt that surrounds the geomagnetic pole. Such activity, called an auroral substorm, occurs several times during a geomagnetic storm [Akasofu, 1964] (Figure 1). The most spectacular part of these displays happens during the expansion phase, which lasts for, at most, 1 hour of the 3–4 hours of a substorm’s average duration. The expansion phase is preceded by a mysterious delay during which Earth’s magnetic field begins to respond to the gathering storm but displays little auroral activity—the so-called growth phase. What drives this expansion phase? The question has long perplexed auroral scientists and remains one of the most challenging issues in space physics. Using a great variety of ground- and satellite-based observations and computer simulations, space physicists have made great progress in understanding the aurora. Scientists can now think about the aurora in terms of electrical discharge, with currents flowing through the magnetosphere, the region of space dominated by Earth’s magnetic field. Viewing auroras as the product of electric currents on a circuit allows scientists to understand and thus describe the physics of substorms [Alfven, 1967, 1977, 1986]. Crucial questions remain unanswered about the physics of auroral substorms and the specific mechanisms that drive them. Specifically, the solar wind (streams of plasma from the Sun) generates a dynamo, which acts as a power supply. Auroral substorms are how the magnetosphere dissipates that energy, directing it downward to the ionosphere, where current-carrying electrons collide with atmospheric atoms and molecules and make them glow. However, crucial questions still remain unanswered about the physics of auroral substorms and the specific mechanisms that drive them. Most controversial of all is the issue of where this energy is stored and how it is converted. The solar wind blows across the boundary of the magnetosphere, called the magnetopause, where the interplanetary magnetic field (IMF) and Earth’s magnetic field merge. As it blows across this merged magnetic field, it induces an electric current, converting the kinetic energy of the solar wind to electric power. This creates the so-called solar wind–magnetosphere dynamo (S-M dynamo). When the intensity of the southward oriented component of the IMF is large and the solar wind blows more strongly, the power increases. Fig. 2. 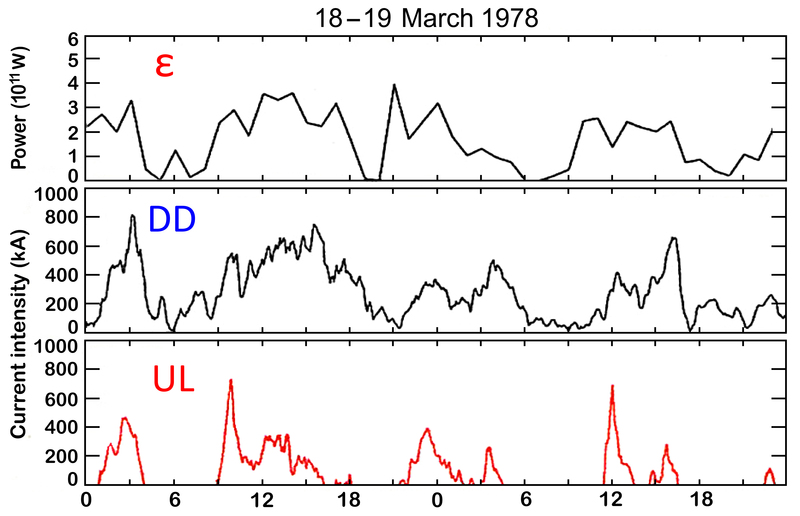 (top) The solar wind–magnetosphere dynamo power (ε), (middle) the directly driven (DD) currents, and (bottom) the unloading (UL) currents are shown over the course of 48 hours (2 days). Note that although both ε and DD vary in a similar way, unlike DD, UL variations are impulsive during two typical substorms. Modified from Sun et al. . When the power becomes strong enough (at about 1011 watts, roughly equivalent to the total power of the thousand largest power plants in the world), the Earth’s magnetosphere responds. The voltage across the boundary of the magnetosphere rises to 100 kilovolts or more, creating an electric current in the magnetosphere-ionosphere coupling system. This current, called the directly driven (DD) current, grows and decays along with the S-M dynamo that drives it (Figure 2). Active auroral displays (the expansion phase) begin about 1 hour after the S-M power is increased. This delay occurs because although the ionosphere is the main sink of auroral energies, the ionization and conductivity are too low to dissipate the power as heat before expansion onset. Therefore, the magnetosphere accumulates the increasing power produced by the S-M dynamo during the growth phase until a threshold is reached, which sets off auroral displays. At this threshold, the growth phase ends and the expansion phase begins. The expansion phase is triggered by the spontaneous formation of an unloading (UL) current system [Bostrom, 1964], which develops in the coupled magnetosphere-ionosphere and lasts for only about 1 hour (as shown in the two good examples of Figure 2). This current drives most auroral phenomena in the polar region during the expansion phase. However, unlike the DD current, the UL current cannot simply be explained by an increase in S-M dynamo power. At its strongest, the UL current can be larger than the DD current peak. This is because the energy used in the expansion phase was previously stored up throughout the growth phase and then unloaded through auroral displays. Therefore, a process other than the S-M dynamo must generate the UL current. If the magnetosphere is like a bucket with a spout that steadily overflows when overfilled (corresponding to the DD current), the UL current is like a “tippy bucket” that dumps all of its energy at once, thus powering the expansion phase. These facts have long been speculated on and suggested by many researchers, but they are now quantitatively understood [Akasofu, 2013]. How Much Energy Can the Magnetosphere Store—and Where? Scientists now have a good understanding of some aspects of the UL’s bucket of energy—namely, its total capacity and the rate at which it empties (and powers the auroral substorm). The total heat production is estimated to be up to 1016 joules, which is dissipated at a rate of about 5 × 1011 watts during the expansion phase. What is unclear—and very controversial—is where the magnetosphere can stably store as much as 1016 joules. This dissipation rate is crucial in understanding substorms, because it relates to the question of how much energy the magnetosphere can hold when it acquires excess energy from the solar wind—that is, how much energy the tippy bucket can store before it tips over. Scientists have long thought that magnetic energy is accumulated mainly in the region of the magnetotail, where solar wind drags the magnetopause back into a comet-like shape on the Earth’s nightside across the equatorial plane. There, the magnetic field lines are nearly parallel, but half of them are oppositely oriented across the equatorial plane. Many researchers believe that these lines can cross at a certain point in the tail and reconnect, releasing a large amount of magnetic energy in the process, which shoots plasma toward Earth. However, there are crucial questions about that premise. The first is whether or not the magnetotail within a distance of 10–20 Earth radii (RE) has enough magnetic energy to power a substorm. Although magnetic reconnection has been observed at a distance of within 20 RE [Angelopoulos et al., 2008], it can be shown that even the total magnetic energy there is insufficient for a single substorm [Akasofu, 2013]. Further, observations of the bursty flows of plasma are inconclusive in terms of their duration and the amount of energy they carry for individual substorms; they may trigger some substorms when other conditions make the magnetosphere ready. Second, the tail-wide flows predicted by magnetic reconnection can explain the DD current but not the UL current—which, as mentioned above, is necessary for electrical discharge processes associated with the expansion phase. This is a critical requirement for considering the magnetic energy conversion. Where Else Could the Energy Be? If the magnetotail does not have sufficient magnetic energy for the expansion phase, scientists might consider the main body of the magnetosphere (within 10 RE) as a potential storage place. This is because the stronger any ambient magnetic field is, the more it can hold magnetic energy. Thus, the main body of the magnetosphere could potentially store excess amounts of energy. The main body of the magnetosphere could potentially store excess amounts of energy. In the past, such a proposal seemed unthinkable. The field lines in the main body of the magnetosphere are not like those in the magnetotail, and thus, magnetic reconnection is rare [Ge and Russell, 2006]. In fact, it is likely that the main body may not even be able to store more than 1016 joules; the magnetosphere may become unstable before the stored energy reaches this threshold. Indeed, this instability may be the cause of substorms. Thus, if magnetic energy conversion takes place chiefly in the main body of the magnetosphere, a whole new theory of the conversion process of stored magnetic energy is necessary. One possibility is that deflation processes (as a result of the unloading) of the main body of the magnetosphere, which inflated during the growth phase, might cause charge separation. Electrons tightly bound around the contracting magnetic field lines shift earthward but not protons (thus not plasma as a whole), generating an earthward electric field. This field, however it is created, is needed to generate the UL current [Lui and Kamide, 2003]. Such a hypothetical charge separation process is called the “thawing” (or breakdown) of “frozen-in field lines” predicted by Alfven . In theory, this process could produce an earthward electric field of 10 millivolts per meter. One crucial satellite observation at a distance of 8.1 RE may support the idea of deflation. The satellite observed a sudden current reduction in the UL (unloading the stored energy), plasma instabilities, and an earthward electric field of as high as 20 millivolts per meter (together with the breakdown of the frozen-in field lines condition), all simultaneous with an onset of the expansion phase [Lui, 2011]. During the last 50 years, through a great variety of approaches, we have learned much about how the solar wind–magnetosphere–ionosphere system can generate auroral substorms. In addressing the question of why the aurora flares up, a more focused question arises: How can the accumulated magnetic energy get unloaded such that it generates the earthward electric fields needed to produce auroras? The author thanks all the magnetospheric physicists of the past and present for their efforts toward great progress in substorm research over the last 50 years. The joint 30-year effort by Y. Kamide, Sun Wei, B.-H. Ahn, A. T. Y. Lui, and C.-I. Meng is crystallized in Figure 2. The author would also like to dedicate this article to the late Lou Frank in honor of the successful imaging of auroral substorms. Akasofu, S.-I. (1964), The development of the auroral substorm, Planet. Space. Sci., 12, 273–282. Akasofu, S.-I. (2013), Where is the magnetic energy for the expansion phase of auroral substorms accumulated?, J. Geophys. Res., 118, 7219–7225, doi:10.1002/2013JA019042. Alfven, H. (1967), The second approach to cosmical electrodynamics, in The Birkeland Symposium on Aurora and Magnetic Storms, edited by A. Egeland and J. Holtet, pp. 1–17, Cent. Natl. Rech. Sci., Paris. Alfven, H. (1977), Electric currents in cosmic plasmas, Rev. Geophys., 15, 271–284. Alfven, H. (1986), Double layers and circuits in astrophysics, IEEE Trans. Plasma Sci., 14(6), 779–793. Angelopoulos, V., et al. (2008), Tail reconnection triggering substorm onset, Science, 321(5891), 931–933, doi:10.1126/Science.1160495. Bostrom, R. (1964), A model of the auroral electrojets, J. Geophys. Res., 69, 4983–4999. Frank, L. A., J. D. Craven, J. L. Burch, and J. D. Winningham (1982), Polar view of the Earth’s aurora with Dynamics Explorer, Geophys. Res. Lett., 9(9), 1001–1004. Ge, Y. S., and C. T. Russell (2006), Polar survey of magnetic field in near tail: Reconnection rare inside 9 RE, Geophys. Res. Lett., 33, L02101, doi:10.1029/2005GL024574. Greely, A. W. (1894), Three Years of Arctic Service, Charles Scribner’s Sons, New York. Lui, A. T. Y. (2011), Reduction of the cross-tail current during near-Earth dipolarization with multisatellite observations, J. Geophys. Res., 116, A12239, doi:10.1029/2011JA017107. Lui, A. T. Y., and Y. Kamide (2003), A fresh perspective of the substorm current system and its dynamo, Geophys. Res. Lett., 30(18), 1958, doi:10.1029/2003GL017835. Sun, W., W.-Y. Xu, and S.-I. 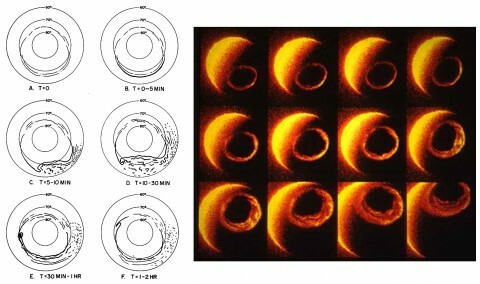 Akasofu (1998), Mathematical separation of directly driven and unloading components in the ionospheric equivalent currents during substorms, J. Geophys. Res., 103, 11,695–11,700. Citation: Akasofu, S.-I. (2015), Why does the aurora flare up?, Eos, 96, doi:10.1029/2015EO027907. Published on 14 April 2015.